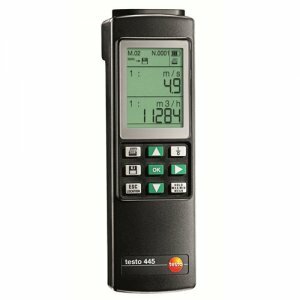 The Testo 445 VAC instrument has two probe inputs for the connection of a broad range of probes for measurements on ventilation/air conditioning systems. The instrument records flow velocity values in a duct, at a duct outlet or on extraction systems. In addition to this, the allrounder measures or calculates the parameters volume flow, Indoor Air Quality, temperature, relative humidity, dewpoint, absolute humidity, degree of humidity, enthalpy, pressure and CO.
At the simple press of a button, the testo 445 displays the last measurment value measured as well as minimum, maximum and mean values. In addition to this, measurement data can be stored according to measurement site and analyzed on a PC, or documented on site with the Testo fast printer.